One of the best strains of all time. The smoke is a perfect mix of indica and sativa. The taste is unique and flavourful. It grows well indoors and outdoors in good conditions. I grew some Blueberry outdoors in the South African summer and the buds were amazing. Grown indoors is a favourite of mine as well. Very stable genetics and resilient plants, can't recommend enough. Just cut down one blueberry and i like her so much. I flowered her for 9 and half weeks under led light with other ladies. Smell is beautiful true blueberry you cant miss and i tried sample and got me stoned as well as others. Crystals everywhere on buds. My all plants love coco coir. Always healthy. Now she is drying and i reckon she will give me about 4 oz dry. Lots of small buds and many big colas and some of buds turned purple from underneath and yes i will grow it again. If you grow blueberry make sure that you have carbon filter otherwise you wont hide lovely smell of indica blueberry. Thank you Tony and other guys from dutchpassion for such a great genes in seeds they make. I just got 5 blueberry seeds. In the summer, I don't know if outdoor is suitable for sowing. I want to buy another seed, but I wonder if it can be delivered to my home in China. Do you have any Regular Blueberry Seeds? You have the category Regular, but only options to buy are Feminized. A friend of a friend is interested in possibly introducing Blueberry genetics into an Auto, so would require a male. A great strain for company that doesn't smoke that often. Relaxing for after dinner and won't make them feel paranoid or have them laughing at everything. Do you send seeds to the USA ?? 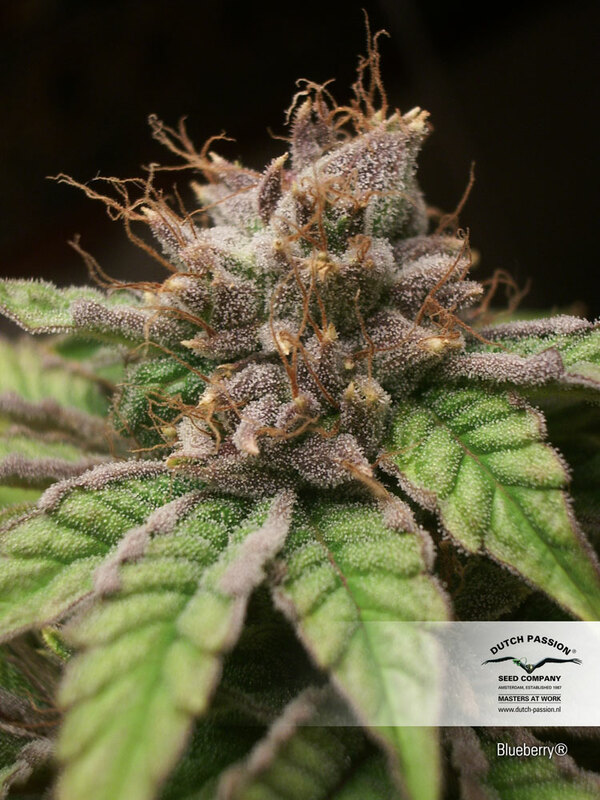 Although this is an old school strain it is one of the most strongest strains I've grown or even smoked for that matter the buds looked great as well absolutely covered in THC! but that isn't why I'll grow it again, the smell and flavour are phenomenal, it is a strain every connoisseur should grow really is a 10/10 from me and haven't had a single plant hermie so don't believe the hype! 4 seeds gave me 2 diffrent phenotypes. One big, early and FULL of resin and one smaller with more fanleafs and a bit slow. Just harvested my first crop of Dutch Passion Blueberry, of which there are many pretenders, and it is simply impressive. Seems so many folks are concerned about how strong in percentage THC or this terpene or that, etc. Cannabis to me is all about personality. A particular strain, jeesh - a particular plant is like a person. The best ones are friends - groovy, understanding friends. They\'re exciting because they show you things you wouldn\'t have thought of on your own. That\'s the kind of friends I want to hang with and Blueberry is one of those kind of friends. You should meet her. Beautifuly heady smoke, loved topping, got a monster plant out of the 5 which had 5 massive cola's on. Couple dip hermie , a week before time, but more seeds and still smoked great. My Blueberry plant just gave me 3.5 Oz under a 400w HPS in coco. 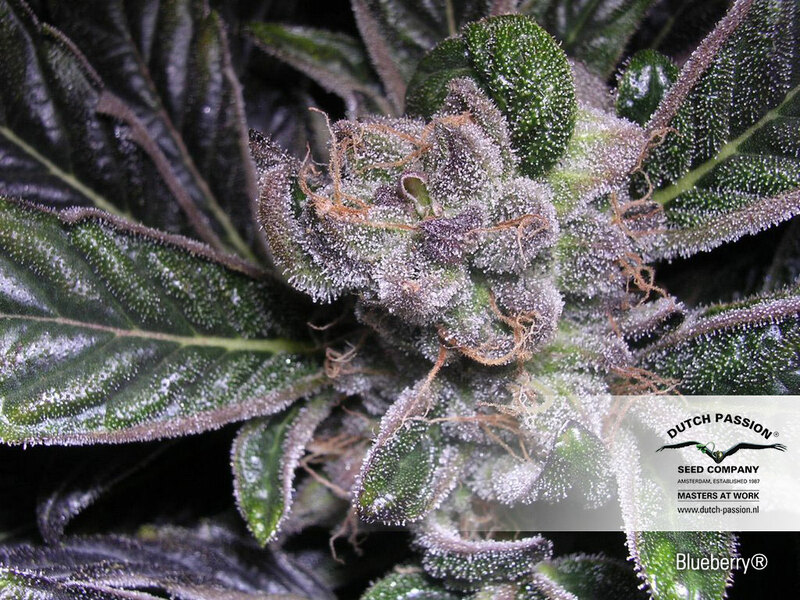 The dry buds smell like blueberry jam, and are lightly purple coloured. The high is really upbeat and happy but very relaxing and sofa friendly at the same time. I'm really impressed with Blueberry, the flavour is way above what I expected and the smell is just so sweet and fruity. Thanks Dutch Passion Blueberry fems are my current favourite. My first grow was with Blueberry, foxtailed which looked great. The taste is sweet but with a smooth undertone. In the jar after a cure you can smell the blueberry too.. Very nice, I would love to do a SoG in the future with her. Dutch Passion Blueberry got me a years worth of highest quality medicine from 5 beautiful plants grown organically indoors. I dont think you can get better than this variety, its just top quality. actually you can grow Blueberry outdoors, we do it all the time here in spain. Just start the seedlings on your window ledge and get them outside either in the garden or on the upstairs sun deck by the end of April and you have cracked it. Its relaxed round here and not a problem to grow a small number of plants for yourself so long as you dont grow too many. I grow Blueberry as it is such a great stoney feeling, you just dont get that type of quality very often. And yields are fine especially with the Blueberrys rooted in the garden , keep them watered and they grow as tall as I do and are covered in bud at harvest. Each year I do 5 or 6 of them and get enough pot for the following year. I haven't bothered growing a different strain for a while - this is more than enough for me and suits the lifestyle. I only wish you could grow Blueberry oudoors in northern Denmark, but it is not possible I have tried many times. Indoors she is a great plant to grow. Yes DP are right she is a pretty plant but the beauty is all in the smoke. Times have changed, in Denmark if you want the best quality grass you have to grow it yourself these days. 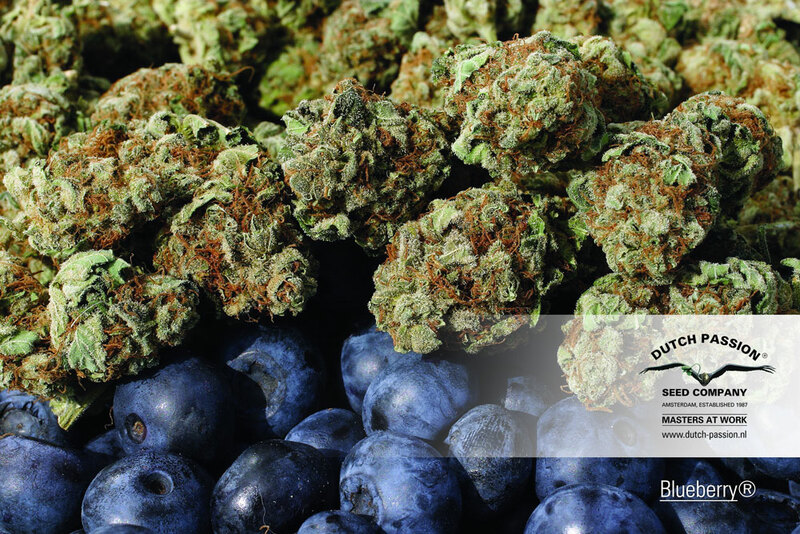 Blueberry is just best qualities all the way through - one of my real favourites after 20 years of smoking. Blueberry is my all time favourite, and probably became so the first time I had some in a coffeeshop in the 90's. 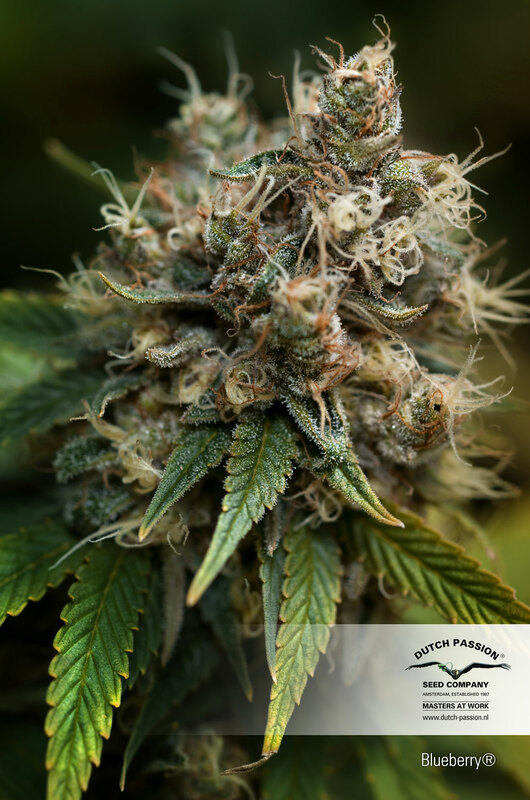 It is a quality original indica with just enough sativa to make a top quality experience without giving it too much of a sativa edge to the high. In my greenhouse I get more of the blue colours and flavours than I do from my indoor grow - which DP say is due to the cooler night-time temperatures. I agree it is expensive, but when you are getting a few ounce from a plant I don't mind paying a bit more for the seeds.